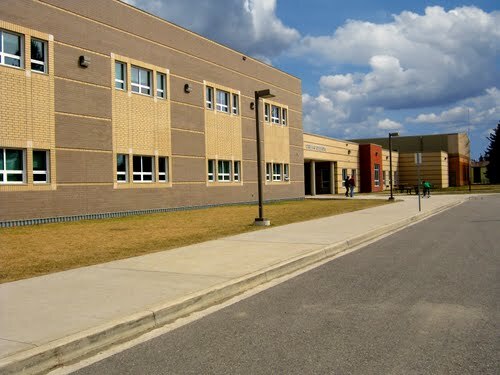 Carberry Collegiate is a place where each individuals' rights are respected. In an environment of safety, trust and fairness, each student can set personal and educational goals. At the same time students are encouraged to get involved and become productive members of our school and community. The reconstructed Carberry Collegiate is located at 230 Main Street in Carberry, Manitoba. This new building was officially opened on December 11, 2008. We are a 5 - 12 school with a total population of 341 students (Septemeber 2016). Enrollment in grade 5 - 8 is 170, and 171 students are enrolled in 9-12. Our instructional staff consists of 22 full time equivalent teachers, along with 5 educational assistants. We are able to deliver programs in Band, Phys. Ed., Home Ec., Industrial Arts, French, and Resource. Student Services are coordinated through the division office. 1.5 secretaries, a full time librarian, and 5 custodial staff provide additional support to our students and staff. Carberry Collegiate staff and students have access to high speed internet service in two 28 station computer labs, plus a 10 seat lab in the library.